This two-deck spa features both exclusive spa staterooms and an extensive range of top-quality facilities and treatments, in an elegant, tranquil setting. Take a Splash at sea! A huge outdoor screen that plays hit movies, sporting events, and even cartoons. With all the dining venues on each ship, guests can always try something different. Something fun to do for everyone in the family! A kid-free zone, on select ships, where adults 21 and over can enjoy whirlpools, bar service and mellow music. It's a tranquil "getaway within your getaway." Exciting features on Carnival's newest ship include Carnival WaterWorks, adults-only Serenity, Cloud 9 Spa, and more! Low Price Guarantee on all Carnival Cruises! Book any Carnival cruise with us and you'll get the best deal possible, regardless of the ship or sail date! 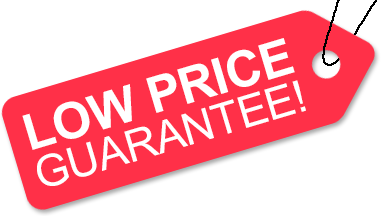 Because of our "Low Price Guarantee," nobody beats our Carnival cruise prices, so look around and you're sure to find the best Carnival cruise deal possible when booking with us! Pre-Paid Gratuities on Carnival Cruises! Get Cruise Cash when you book a Carnival cruise with us. The value of the Cruise Cash depends on the particular cruise and accommodations you book. Cruise Cash values are listed on Step 3 of the online booking process. ♦ A limited time reduced rate on your cruise fare! Offer valid for new bookings made April 1 - 30, 2019 only. Additional restrictions apply. Offer is capacity controlled and subject to availability. ♦ A Reduced Rate on your cruise! ♦ Two Category Stateroom Upgrade! Valid on new bookings made April 22 - 30, 2019 on select sailings departing through Spring 2019 only. Additional restrictions may apply. Offer is capacity controlled and subject to availability. We reserve the right to correct errors. Early Saver, Onboard Credit & Reduced Deposits! ♦ Carnival Early Saver & Early Saver Last Call rates! ♦ Limited time Reduced Deposits! ♦ Up to $50 Onboard Credit per stateroom, depending on voyage length! Offer valid for new bookings madeApril 22 - 23, 2019 only. Additional restrictions apply. Offer is capacity controlled and subject to availability. We reserve the right to correct errors. Save up to 20% with our Early Saver Discounts on Carnival Cruises! Book a 3- to 5-night Carnival cruise at least 3-months in advance, or a 6-night or longer Carnival cruise at least 5 months in advance and save up to 20%! Plus, get Price Protection from Carnival: If you find a lower Carnival Advertised Rate, after booking, Carnival will honor it and issue the difference in the form of a non-refundable onboard credit. We do not charge booking fees on any cruises! You're sure to enjoy an affordable Carnival cruise when booking with us! Our special offers on Carnival Cruise Lines may not be combinable. Certain restrictions apply to each offer. View terms and conditions during the online booking process. Carnival Cruise Lines is the largest and most popular cruise line in the world. Carnival offers their fleet of "Fun Ships," operating voyages from 2- to 17-nights in length to many destinations. Carnival offers cruises to the Bahamas, the Caribbean, the Mexican Riviera, Alaska, and Hawaii. They even offer cruises to nowhere for those of you that don't have a lot of time to get away…or for those of you that are looking to get a taste of what Carnival Cruise Lines has to offer. Carnival is particularly well known for their festive-yet-casual atmosphere. Carnival Cruises offers a variety o f onboard dining options, including both traditional (assigned) and open dining formats. They also have lots of entertainment and activity options to suit anyone's mood or taste. Carnival's ships offer everything from elegant multi-course meals in their dining rooms, to more casual meals available in their "Seaview Bistros" and 24-hour pizzerias. The Carnival cruise ships also feature dazzling Las Vegas-style entertainment, along with a full slate of morning-til-night activities to take part in. A Carnival Cruise Line "Fun Ship" cruise truly offers something for everyone…and then some! American Discount Cruises & Travel is proud to offer the best deals possible on all Carnival cruises booked with us. Backed by our "Low Price Guarantee," and powered by our team of expert travel agents, we're sure to exceed your expectations when booking your next Carnival cruise! Why Choose Carnival Cruise Lines? Carnival cruises are a great option for anyone looking to cruise. They offer fabulous options for families, friends, couples, singles and seniors. Additionally, each Carnival cruise ship features many swimming pools, a full gambling casino, onboard duty free shopping, a major spa and fitness facility, and "Camp Carnival," a complimentary fleetwide children's program that hosts around 175,000 kids a year. Among the fabulous features available on select Carnival ships (Carnival Breeze, Carnival Dream, Carnival Ecstasy, Carnival Fantasy, Carnival Fascination, Carnival Imagination, Carnival Inspiration, Carnival Legend, Carnival Magic, Carnival Pride, Carnival Sensation and Carnival Sunshine) is Carnival's WaterWorks Park, a elaborate water park featuring a giant twister water slide. Carnival's Seaside Theatre is a 12-foot-high by 22-foot-wide LED screen located poolside on select Carnival ships, showing movies, sporting events, concerts and other special programming. Serenity Retreat is an adults-only area for those looking for some relaxation. Spa Carnival is another fantastic area available onboard Carnival's ships, featuring a state-of-the-art fitness center, salon and various body treatments. Carnival's dining program is called Your Choice Dining because when it comes to eating, it's really "your choice" as far as where and when you want to eat. For example, you can choose between assigned dining (at 6:00 pm or 8:15 pm) or Your Time Dining (an open dining format, available between 5:45 pm and 9:30 pm). What's New for Carnival Cruise Lines? Carnival Victory will receive a major bow-to-stern makeover in 2020, and will emerge from dry dock with the new name of Carnival Radiance. The $200 million renovation will take place March 19, 2020 through April 26, 2020 and include beverage, entertainment, bar and stateroom updates. Clients will be able to experience dining additions such as Cucina del Capitano, Fahrenheit 555 Steakhouse, Guy's Pig & Anchor Bar-B-Que Smokehouse and much more, as well as unwind at the new Cloud 9 Spa. Itineraries for Carnival Radiance will be announced mid-November 2018. In July 2018, Carnival Cruise Line revealed plans for a nearly $200 million bow-to-stern makeover for Carnival Triumph in the spring of 2019. The updated ship will join Carnival’s Sunshine class and will be named Carnival Sunrise after a two-month-long refurbishment that will add all of Carnival’s wildly popular branded food, beverage and entertainment innovations, as well as update all staterooms in a broad spectrum of new accommodations. Following a renaming ceremony, Carnival Sunrise will re-enter service with a series of five- to seven-day voyages from Norfolk, Va., beginning April 29, 2019, a summer schedule of four- to 14-day departures from New York commencing May 23, 2019, then move to Fort Lauderdale in October 2019. Carnival's third Vista-class ship, Carnival Panorama, will be deployed to Long Beach, California in 2019. Offering seven-day Mexican Riviera cruises, Carnival Panorama will include new venues such as the Fahrenheit 555 steakhouse, Library Bar and Bonsai Sushi, and new attractions like the gravity-defying SkyRide, a massive WaterWorks aqua park, and the SportSquare recreation area. Additional features will be announced at a later date. Carnival Victory emerged from dry dock in January 2018 boasting several new venues. Additions include Guy's Burger Joint, RedFrog Rum Bar, BlueIguana Cantina and Tequila Bar, Alchemy Bar, Cherry On Top and Camp Ocean. In 2017, Carnival Elation underwent a multi-million-dollar renovation that included the addition of 38 all-new staterooms, including two Grand Vista suites that feature floor to ceiling windows, 22 junior suites, two ocean-view cabins and 12 interior staterooms. The décor of all staterooms was updated to reflect a bright and calming island theme, inspired by the destinations visited by the ship. Balconies were also added to 98 existing rooms. In addition to the cabin updates, Carnival Elation also received four new bars and dining venues, including Guy’s Burger Joint, the Redfrog Rum Bar, BlueIguana Cantina and BlueIguana Tequila Bar. Finally, the addition of Camp Ocean, a new play area designed for children ages 2-11, a new WaterWorks Park with a 300-foot long Twister slide and a new mini golf course completed the updates. Carnival Sensation emerged from dry dock in March 2017 boasting several new venues. Additions include Guy's Burger Joint, RedFrog Rum Bar, BlueIguana Cantina and Tequila Bar, Alchemy Bar, Cherry On Top and Camp Ocean. Carnival Paradise will be the first ship in the Carnival fleet to feature port of calls in Havana, Cuba starting with 4- and 5-night voyages departing in June 2017. Itineraries will include daytime and overnight visits in Havana, as well as stops in either Cozumel or Key West. Carnival announced the anticipated addition of a third Vista-class ship in 2019, originally designated for the P&O Cruises Australia branch. The ship will offer many unique, Vista-class innovations alongside Carnival guest favorites. In exchange, Carnival Splendor will be transferred to P&O Australia in late 2019. Scheduled for delivery in March 2018, Carnival Horizon was officially named in July 2016. Currently under construction at the Fincantieri shipyard, Horizon will enter the fleet as Carnival's second Vista-class ship, following the debut of Carnival Vista in May 2016. In April 2016, Carnival announced the launch of its Cozumel Plus itineraries, extending the length of time its ships spend in Cozumel, Mexico. The additional time in port will give guests more time to immerse themselves in Mexican culture, as well as to explore Cozumel's beaches, shopping and dining opportunities. In late 2016, Carnival Liberty and Carnival Breeze replaced Carnival Magic and Carnival Triumph in Galveston, joining Carnival Freedom. Carnival Triumph was relocated to New Orleans, where it joined Carnival Dream and replaced Carnival Elation. Carnival Elation replaced Carnival Fascination in Jacksonville, offering significantly longer 10-11 day repositioning voyages; Carnival Fascination repositioned to San Juan in Spring 2016, to offer year round 7 day cruises. Carnival Miracle underwent extensive refurbishments when it entered dry dock in March 2015. The new features, all a part of Carnival's ongoing Fun Ship 2.0 ship enhancements, include popular programs like Seuss At Sea and Hasbro, The Game Show, as well as new dining venues and the addition of four new spectacular shows! Carnival Vista, the first of a new class of Carnival cruise ships, is the next cruise ship for Carnival Cruise Lines. With an expected delivery during the Spring of 2016, she's going to be the first of a new "Vista" class of ships. At 133,500-tons, Carnival Vista will be the largest "Fun Ship" ever constructed, and will accommodate up to 3,954 passengers and feature a variety of Carnival Funship 2.0 enhancements. A sister ship (yet to be named) is expected to debut during March of 2018. Be sure to check back here soon for more information. Carnival launched its winter schedule with the refurbishment of Carnival Pride, which emerged from a $75 million dry dock in November 2014. Boasting a variety of innovative additions, this upgrade to the line's Fun Ship 2.0 enhancements include the introduction of new dining and beverage venues, such as Guy's Burger Joint (developed in tandem with celebrity chef Guy Fieri) and Alchemy Bar. Another exciting addition is a massive WaterWorks aqua park, whose crowning attraction "Green Thunder" holds the title of fastest and steepest water slide at sea, as well as four new Playlist Productions shows. Carnival is now rolling out Camp Ocean across their fleet of "Fun Ships." The new program is designed for children between the ages of 2 and 11 and will feature more than 200 ocean-themed activities. Children will have a chance to play and discover in a fun, yet educational environment. Carnival Freedom is the first to receive the Camp Ocean program with the rest of the fleet receiving the program by 2016. Starting February 2014 onboard Carnival Splendor, Carnival introduced the Seuss at Sea program to their fleet. Combining all the excitement of a Carnival cruise with the beloved Dr. Seuss takes the family-friendly brand to a whole new level of fun. Families can meet their favorite characters at special Green Eggs and Ham breakfasts and children can hear their favorite Dr. Seuss novels during Seuss-a-palooza Story Time. The world of Dr. Seuss also comes to life in Bookville, a special Dr. Seuss themed play area. Check out our Seuss at Sea page for more details! Carnival Mardi Gras- COMING SOON! Carnival Vista - NEW SHIP! Click a price below to view the Carnival cruises available during that month in that destination.